Posted on Mon, Oct 24, 2011 : 1:03 p.m. 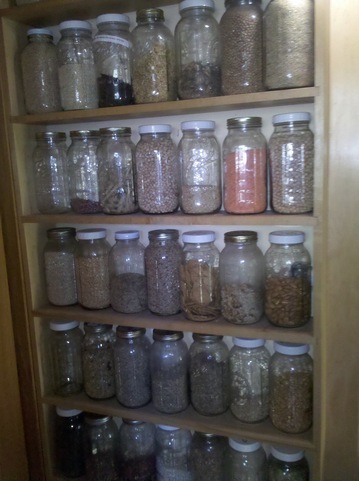 I store my dried herbs in half gallon jars with my grains, beans, and other bulk items. It’s easy to dry your own herbs and spices to use all winter. Safely stashed in a jar away from light and warmth, your own herbs will be potent and even an intoxicating reminder of the sunny warm days just passed that will come again. It isn’t too late to find some wild plants, as well as the “wild adapted” herbs that may have invited themselves into your yard and garden. Drying is easy. Choose healthy, green, non-moldy, non-rotting plants. That’s obvious. You also want to avoid washing them, unless they are muddy or sandy, or you’re not sure about the cleanliness of the surroundings. If you do wash the plant, dry it as thoroughly as possible using a dish towel to pat it dry. For sturdy leaves you can use a salad spinner first, followed by the towel. Avoid damaging the leaves, so that they dry uniformly and don’t start to decay before they’re dry. If the leaves are larger, there are many options. You could just tie some leaves together with string or even a twist tie and hang them in a place out of the sun, and where there is good air circulation. Don’t overcrowd them; a bunch of leaves smashed together may turn moldy before they have time to dry. When in doubt, increase the air space and contact. You can also spread them on screens and stash them in your attic or other warm location. I suppose the type of screen makes some difference. I avoid aluminum, but there isn’t really much chance of the screen material contaminating the plant. Check the drying plants every day or two. Drying time varies, depending on the moisture in your home, location, the existing moisture in the plant, etc. Smaller leaves and plant parts can be left on the stem and use the above methods, but you can also dry them in a paper bag. Leaves can be dried with the pilot light from an older gas oven, or a few hours in the oven at less than 200 degrees. I like to leave the oven on for a few hours, then turn it off and leave the plants in overnight. A dehydrator can also be used: just follow the directions that came with it. With more dense, wet plants, you’ll want to open the oven door a few times to briefly let out moisture. But that is more the case when drying fruit or vegetables. I tried microwaving some herbs for the first time last week. It took about four minutes to turn some fresh sage crispy. I have no reservations about doing this for herbs to burn, for ritual or for the scent. However, there are subtle changes to vitamins and proteins when food is microwaved, different from conventional heating. While most of the research I’ve seen is on breast milk, we don’t really know the effects on plant parts that are not ingredients in food. Since you’re trying to preserve the optimal amount of nutritive parts, I would skip the microwave as a plant-drying method until we know more. The plant material should be thoroughly dried before you store it. It should be crumbly, easily falls apart when crushed, and with no trace of moisture in the leaves. Pack it into a jar with a lid, be sure to label it with name and date, and keep it in a cool dark place. 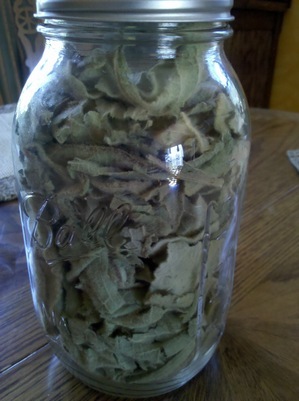 Dried Mullein, to use as an infusion to nourish and strengthen the lungs. A wonderful gift from a friend. What wild foods can you dry now? Bee balm (Monarda) makes a great oregano substitute. All of the mints can be dried for later herbal teas or to use in cooking. Why buy mint tea when you can harvest and dry your own for free? Chives and onion tops can be dried and reconstituted later in sauces, soups, dressings and salads — the same with wild garlic leaves. Wood sorrel (oxalis) makes a nice lemony addition to winter soups. Some of the nutrient-rich greens like lamb’s quarters (Chenopodium), yellow dock (Rumex crispus) and dandelion (Taraxacum officinale), can be blanched and frozen but also dried and added to soups, especially for added nutritional value. Staghorn Sumac (Rhus typhina) is also easy to identify now, and the red drupes can be removed from the mass and then can be dried for later use as a beverage or seasoning. Because these berry-like bits are more dense and moist, I usually use sun to dry them thoroughly. A day or two in the sun, and they are ready to store. You can also dry medicinal plants and leaves for herbal infusions. Mullein (Verbascum thapsus), Red Clover (Trifolium pratense), Lemon Balm (Melissa officinalis), Goldenrod (Solidago), Red Raspberry leaves, (Rubus idaeus)... the list is really almost endless. Some of the best plants for infusion can’t be harvested now; for examples, Stinging Nettle (Urtica) is harvested in May. Right now there are only a few Goldenrod plants that still have flowers. As always, be careful about making sure you have properly identified the plant, that you check what you pick to be sure no contaminants or other plants got mixed in, and use clean and dry jars to store the material. Most dried plants and herbs will retain value for about a year. You can extend that a bit by storing the dried plants in your freezer, but you should plan to replenish your supply each year. Linda Diane Feldt is a local Holistic Health Practitioner, teacher, and author. Her most recent publication is “Cultivate Curiosity and Anticipate Miracles: Observations of Life”. Available by serialized subscription. Linda Diane is offering a free class on seven local roots you can harvest now, sponsored by The People’s Food Co-op. The class is Thursday, Oct. 27 at Crazy Wisdom Bookstore and Tearoom, 7-8:30 p.m. You can follow Linda Diane on Twitter, visit her web site, or contact her directly wildcrafting@lindadianefeldt.com.